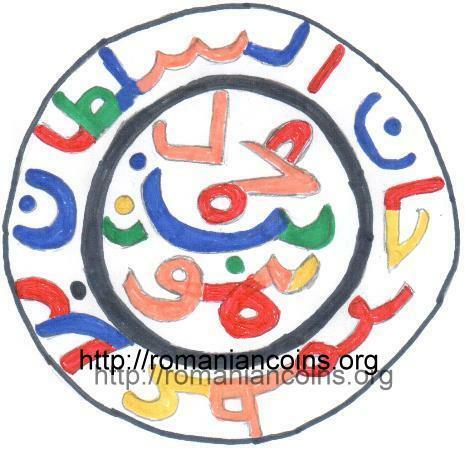 The second medieval coin pictures above are present on Romanian coins through the kind permission of Mr. Sarviro. 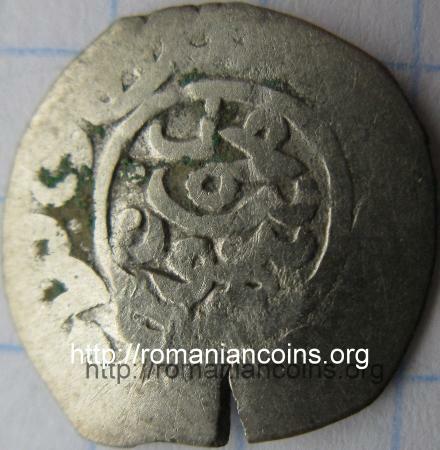 Numismatic literature mentions the existence of small Tatarian silver coins which have been countermarked with the coat of arms of Cetatea Albă - a cross with four globules between the arms. Since the countermark is similar to the cross on the Asprokastru strikings (presented on the previous page), it is believed that the two types of coins are contemporary. Reference  considers the Asprokastru coins to have been struck around 1450, during the reigns of Alexandru II (Alexăndrel = Tiny Alexander) or Petru Aron. Hence it would ensue that the countermarks were performed around 1450 also. However other opinions exist. Based on an older paper of numismatist Octavian Iliescu (which we did not find), an Italian researcher, Lunardi  considered the Tatarian coin countermarked with the coat of arms of Cetătea Albă as issues of the Genoese colony in town and dates them to the 1463-1465 time frame. Reference  shows these countermarked pieces as local issues, struck after the monetary reform of Stephen the Great and the Holy around 1465. 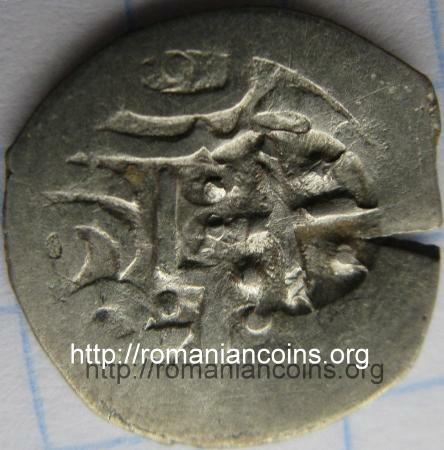 Interesting enough, such coins were found in the county of Iaşi, at Cîrpiţi ,  (nowadays Victoria). It is also interesting to observe that the title of the silver of these coins was measured - it is between 66.6% and 89% . 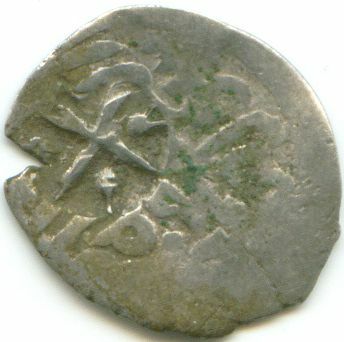 The coat of arms of Cetatea Albă was struck over a silver dirham of Küchük Muhammad, one of the khans of the Golden Horde. The Golden Horde (also known as Kipchak Khanate) was the western part of the Mongolian Empire. It was founded by Batu Khan (1207-1255). The denomination of dirham comes from drachma, monetary and weight measurement unit in ancient Greece. Küchük Muhammad (küchük means "small" or "short" in Turkic languages - see the name of village Kücük-Kainargi, named in Romanian Cainargeaua Mică) ruled over a troubled period of Golden Horde's desintegration. He assumed power around 1435 and lost it around 1459. Küchük was a nickname and, as such, does not appear on the coins. Under the rule of Küchük Muhammad the Golden Horde lost vast territories. In 1437 Ulugh Muhammad (Ulugh would mean "tall"), the former Golden Horde khan (1419-1422 and 1427-1437), created the Kazan Khanate. In the fifth decade of the century Crimea had become an independent khanate under the rule of Melek Khaji Girai (~1396-1466), one of the descendants of Genghis Khan (1206-1227). ﻣﺤﻤﺪ ﺑﻦ ﺗﻴﻤﻮﺮ - Muhammad bin Timur. ﺍﻟﺴﻠﻄﺎﻦ ﺍﻻﻋﻈﻢ ﺧﺎﻦ , where al-a'zam means great or supreme . 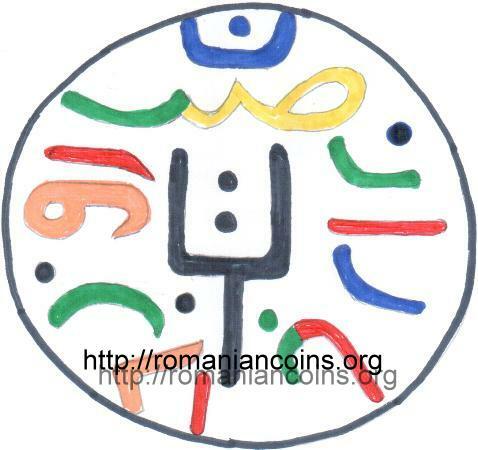 The tamga or tamgha was an emblem used by Altaic tribes (Huns, Mongolians, Turkic peoples etc. ); seal. The tamga used on the Tatarian coins of Crimeea stands for the stylized trident of Girai I, founder of Crimean Khanate and declared successor of Genghis Khan. According to the inscription, the coin was struck at the Orda-Bazaar (or Ordu-Bazaar) mint. The localization of the mint is not (as we read on the Internet) very certain. Based on the spread of coins bearing Ordu-Bazar indication, it is considered they were struck some place in the steppe region north to Crimea, close to River Dnieper, in the actual region of Kherson. Coins of Melek Khaji Girai, first khan of Crimea, are known to have been struck here - so the mint ought to be close to Crimea. Reference  points that the Ordu-Bazar mint could have been placed somewhere close to the Ural Mountains. Reference  comes with the hypothesis that this mint was mobile, accompanying the khan and his court. Not unlikely, if we take into account that ordu means army or army camp (English language has the word horde, Romanian language has words "ordie" and "hoardă", meaning ferocious army), and bazaar means basically the same as in English. It is not excluded that several mints called Orda-Bazaar to have existed. 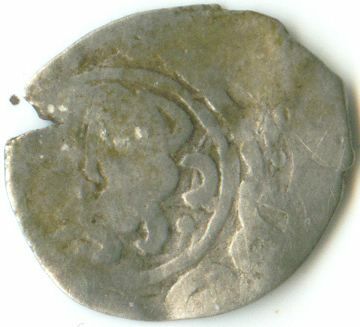 The coat of arms of Cetatea Albă was struck over a silver dirham of Syed Ahmed I, one of the khans of the Golden Horde. Syed Ahmed I ruled between 1433 and 1435 (however the chronology of Golden Horde khans is not very well known). ﺳﻴﺪ ﺍﺤﻤﺪ ﺧﺎﻦ - Syed Ahmed Khan. ﺍﻟﺴﻠﻄﺎﻦ ﺍﻻﻋﻈﻢ ﺧﺎﻦ , with visible fragment "n al-a". ﻻ ﷲ ﺍﻻ ﷲ ﻣﺤﻤﺪ ﺭﺳﻭﻞ ﷲ - La ilah illa Allah Muhammad rasul Allah, meaning "There is no god but God, Muhammad is the messenger of God".